One Woman holds the Key to a planet’s fate. The new Science Fiction Adventure Romance series by Wendy C Giffen reveals a genetic link with inhabitants of other worlds — long ago a dying star sent humans fleeing across the galaxy. Separated and alone, they discover a gamut of life forms and experiences before they find various places to survive. 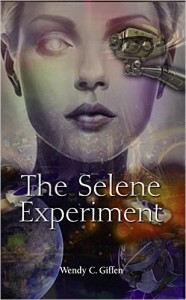 But not for long: On the planet of Selene, an escaped human science experiment, Rowhan, only wants to survive. To do that she needs to prove she’s vital to saving the planet from an enemy within and an enemy from space, and is not the abomination the ruthless hunters believe her to be. A stand alone book, this is the first of a seven book series.